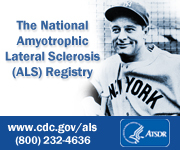 Just learned my mother has ALS (Amyotrophic Lateral Sclerosis), also known as Lou Gehrig's disease. This is a tragic disease that causes the patient to progressively lose control of all of their muscles until they become totally paralyzed. It's uncommon enough that it's considered an 'orphan disease', meaning it doesn't receive a lot of attention from the media and researchers, and patients and families are to a large extent on their own in trying to figure out how to deal with it. There isn't even much information about who has ALS, but there is an effort to create an ALS registry. Just knowing who has the disease and where they are located would be a great assistance to the researchers who are investigating ALS. So I'm adding a button to this site that links to the ALS registry. If you know anyone touched by this disease, encourage them to add their names to the ALS registry.